UNITED NATIONS, January 20 -- The criminal complaint in Haiti against Baby Doc Duvalier was filed by Michele Montas, who is currently being paid by the UN as a Special Adviser. After long refusing to answer whether and how much the UN is paying Ms. Montas, the UN finally confirmed to Inner City Press that "Ms Montas was engaged by the mission's senior leadership as the D-1 Special Advisor to the Head of Mission. Her contract will terminate on 30 June 2011." Under applicable UN Rules prohibiting people paid by the UN from “any action and, in particular, any kind of public pronouncement that may adversely reflect on their status, or on the integrity, independence and impartiality,” Ms. Montas must or should have checked with the UN before filing her lawsuit, and certainly before making her statements on CNN and elsewhere. If permission was granted, then the UN's attempts to distance itself from the suit, and to say it has nothing to do with it, ring false. Even when the UN does or allows the right thing, it doesn't have the courage to say so, and remains mired in lawless double standards. Inner City Press on January 20 asked UN spokesman Martin Nesirky what rules apply to the statements and action of people paid by the UN. Video here from Minute 17 and 21:20. Nesirky said that Ms. Montas was operating in her personal capacity. Inner City Press asked, repeatedly, if she had requested and gotten approval for her statements and lawsuits, which Inner City Press went out of its way to say are laudable. Nesirky said, “It's besides the point if you are in favor of it or not.. it's in her personal capacity which she has every right to do." He added that “I'm not talking about rules." Inner City Press has been approached by UN staff members who have been prohibited, under this rule, from even attended events critical of the UN or particular political developments or leaders. So it would seem clear that Ms. Montas must or should have checked with the UN, Mr. Mulet, Legal Department or higher, before making the statements. Nesirky, after being Pressed, said that "you can be sure that Ms. Montas will have been speaking with her colleagues before she spoke." Inner City Press said, under the Rule, that must mean the statements and lawsuit were vetted and approved. Nesirky insisted he had described what happened, but would not specify to whom Ms. Montas spoke, nor what they said. He claimed you cannot extrapolate. But doesn't or shouldn't the UN have rules that apply equally to all? Nesirky backtracked, sought not to provide factual answers and tried to stop Inner City Press from questioning. Video here, from Minute 21:20. But it is a simple factual question: did Ms. Montas check with the UN, and did they sign off? Nesirky refused to specify who Ms. Montas had asked, or even what rule applied. Minutes later in front of the Security Council, Inner City Press on camera asked top UN Peacekeeper (and Mr. Mulet's “boss”) Alain Le Roy about Duvalier and Ms. Montas. Le Roy said he was aware of Montas' action. Video here. Afterward off camera, Le Roy told Inner City Press that “so far the UN is silent” on Ms Montas' suit, and that he would try to “get something from OLA,” the UN Office of Legal Affairs. That would seem to be Nesirky's job, as spokesman. Watch this site. UN Denies Role In Haiti Detaining Duvalier, Pays Montas Calling For It, Kouchner? UNITED NATIONS, January 18 -- With Baby Doc Duvalier apprehended in Haiti, the UN in New York insisted Tuesday at noon that it had nothing to do with the arrest. But the UN has acknowledged to Inner City Press that it is still paying Michele Montas, through June 2011 -- and Ms. Montas' public statement on CNN about filing a criminal complaint is reportedly related to the arrest. 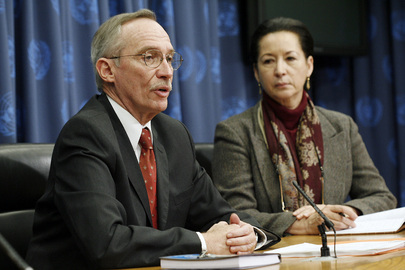 Ms. Montas' successor as Ban Ki-moon's spokesperson Martin Nesirky disclaimed any UN involvement in Duvalier's detention. He did however call him a “dictator” who was chased out of his country by his own people. Minutes later, asked about Tunisia's Ban Ali, Nesirky would not use the same words or call for accountability. Earlier, UN envoy to Cote d'Ivoire Choi Young-jin spoke of denying Laurent Gbagbo funds to pay “his” 140,000 civil servants. Is Gbagbo less legitimate than Myanmar Than Shwe or North Korea's Kim Jong-Il? Is the UN trying to deny their civil servants their pay? Meanwhile, the French press is reporting that Bernard Kouchner's “courtesy” visit with Ban Ki-moon was about replacing Edmond Mulet as top UN envoy to Haiti. Nesirky on January 17 said he refused to comment on rumors. Inner City Press asked top UN peacekeeper Alain Le Roy, what about Kouchner to Haiti? It is up to the Secretary General, he said, and no decision is needed until March. But what would then happen with Peacekeeping's Number Two, Atul Khare, if Mulet returns to this post? Especially with major troop contributor India now on the Security Council? In response to your querry with the Spokesperson of the Secretary General regarding Ms Montas's appointment to MINUSTAH, please find the answer below. "Following the devastating earthquake of January 2010, which had a severe impact on the substantive sections of MINUSTAH, Ms Montas was engaged by the mission's senior leadership as the D-1 Special Advisor to the Head of Mission. Her contract will terminate on 30 June 2011, when the post itself will be eliminated, as part of the mission's post-surge readjustment."